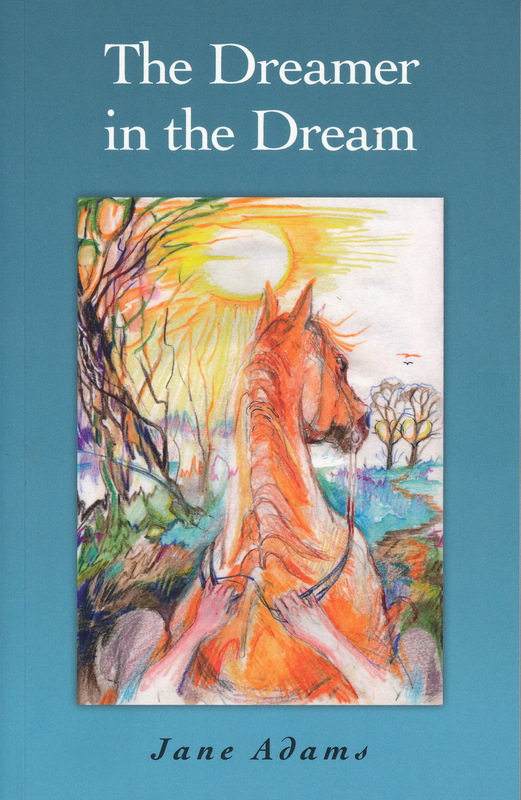 THE DREAMER IN THE DREAM (illustrated) – A Collection of Tales by Jane Adams, published 29 June 2012 by 0 Books. Available from booksellers in USA and UK, and on Amazon and as ebook. 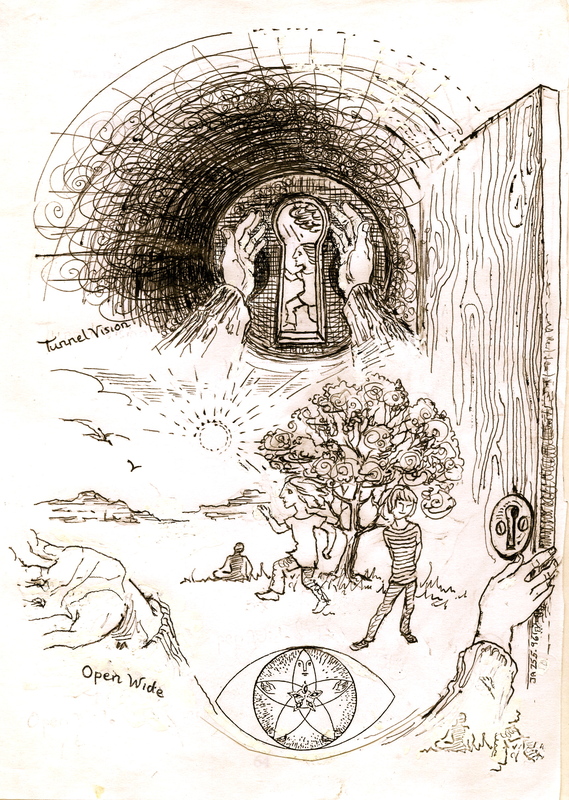 These tales were developed by Jane Adams from rough drafts in Alan Jacobs’ notebooks, and revised from time to time. HIS HEAD strangely clearing as he streamed rivers of sweat, Jeremy very carefully and deliberately retreated and stood his ground. He seemed to have no head at all now, but it didn’t matter. With joyous equanimity the crowd passed through him like a flock of bright sheep and disappeared, and suddenly there was Auntie, bent and withered as an old apple, but quite steady on her pins and seizing his red Paisley tie with impish delight as she reached up to kiss him soundly on both cheeks … and as beautiful as the proverbial maiden behind the dragon’s tail. Jeremy was astonished at his state of mind, but handed over to it, his reins of obligation. With delicate gallantry he offered a strong arm to Aunt Mavis, carried all her luggage with the other, glanced at the train which now sat, strangely small and dismembered like a pig in its platform trough, and took her to lunch at the Savoy. ALL OF a sudden, there was a loud chatter, and their company grew. A little bush squirrel and a curious Quail arrived onto the bank from nowhere. “Who are you?” said Alice – she had got used to asking that question. 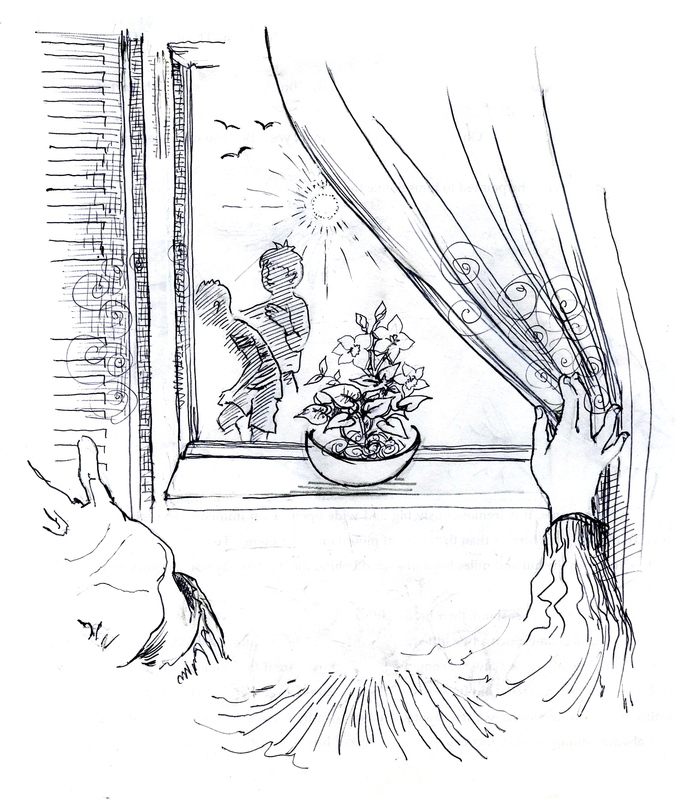 HIS MOTHER kept her thoughts to herself, and told him to eat his breakfast – boiled egg with toasted soldiers, orange juice and a very nice cup of tea. He ate all this while reading his favourite comic, which had been ironed by Hoskins as the paperboy always crumpled it up while posting it through the letterbox with the other newspapers. Now it was time for school. The chauffeur was sitting in the Rolls Royce, ready to take Graydo to school, and his Father to the office. HE SHOWS the children how to play with fire, stalk ghosts and brew outlandish chemistries in a blackened pot. Merlin himself may have taught him, but Marlowe being rather simple and repeatedly sun struck, has forgotten all save a very few simple spells. He is the writer of Perceval’s “Mystery Play”. Once upon a time he knew what the stars foretold, but it is all now hearsay. Published November 2011 by Yogi Impressions, Mumbai. Available from bookstores and from the publishers and on Amazon. The tarot deck is clearly a labour of love and it’s no surprise that it took over 10 years to bring into creation. To me it’s like having a personal guru/rishi who has the time to sit with me and guide me into my inner space, using metaphors, allegories, stories and archetype energies. The amazing detail, synergistic energies and spiritual wisdom that converged to manifest in this sacred tarot is empowering at different levels. I have been reading cards for over 20 years and I have used dozens of decks from diverse traditions, representing a range of eclectic visions, but this is the one deck I hold in my heart because it is like a bridge to higher levels of consciousness. The artwork is interesting and at times surreal, almost like vivid water coloured expressions, but not typically Indian. However, the sacred motifs and yantras along with the basic archetypal suit elements of the traditional tarot are present. To me the artwork isn’t the strength of this deck. What really powers this tarot is the subtle inner energy of the visionaries: namely the writer, the artist, and the others, including the divine energies, who facilitated its creation. I doubt very much I will be using this tarot for divination; that would be like using a classic Rolls Royce to drag race on a dirt road. It will be a tool to develop higher consciousness. 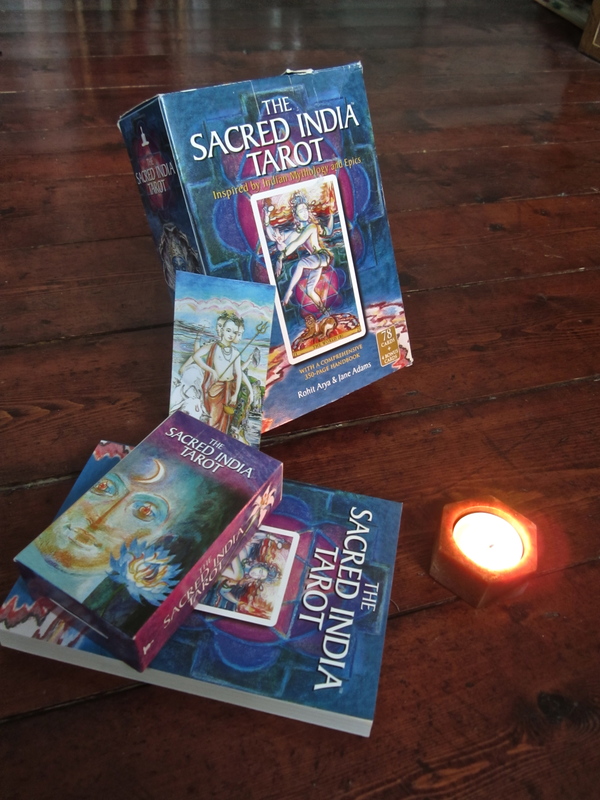 The Sacred India Tarot is worth a lot more than the price you have to pay for the deck and it’s one you’ll want to keep for a lifetime, providing you are a spiritual pilgrim, searching for a quiet awakening beyond the mundane realm of divination and everyday drama. I love lighting some incense and sitting quietly with this deck…it’s like being with one aspect of the divine energy that is Mother Saraswati. I live in Canada and couldn’t get it delivered from Amazon’s US suppliers so I had to purchase from Yogi Impressions in India. No problems and it was delivered on time. See also, posts on this blog, on the creation of the deck – The Sacred India Tarot Archive. Indrani, I have emailed you. Wonderful to hear from you again! Lovely to see your work so beautifully presented. I need to speak to you, please contact me. wowww!!!! what are you?!!!!! amazing symbols,,,, breathtaking…. do u see these in your dreams?!!! 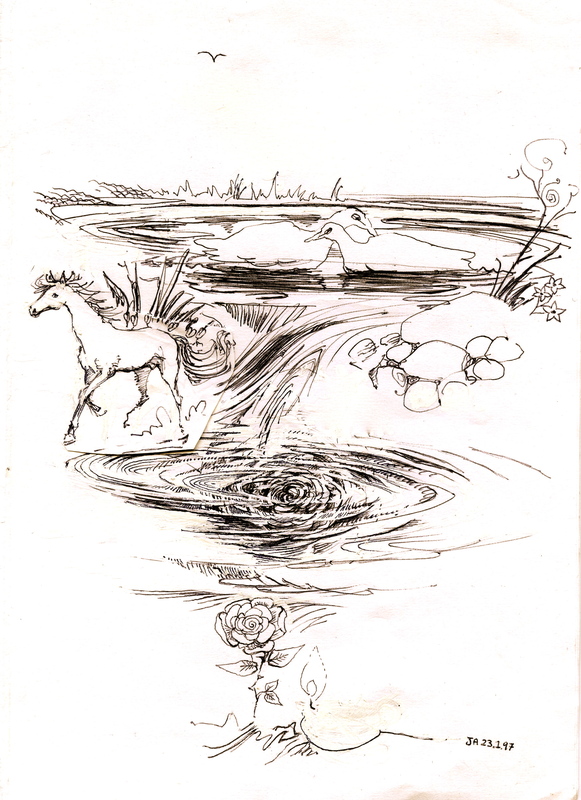 Hello Tatiana – Pierrot and the White Wolf (by Catherine Harding) is not in the Dreamer in the Dream – but I could print a copy for you privately, with all the illustrations. I will email you my address.